As the kids prepare to tear themselves away from the sunny outdoors to go back to school, we have the PERFECT craft that will excite them for the new school year ahead! 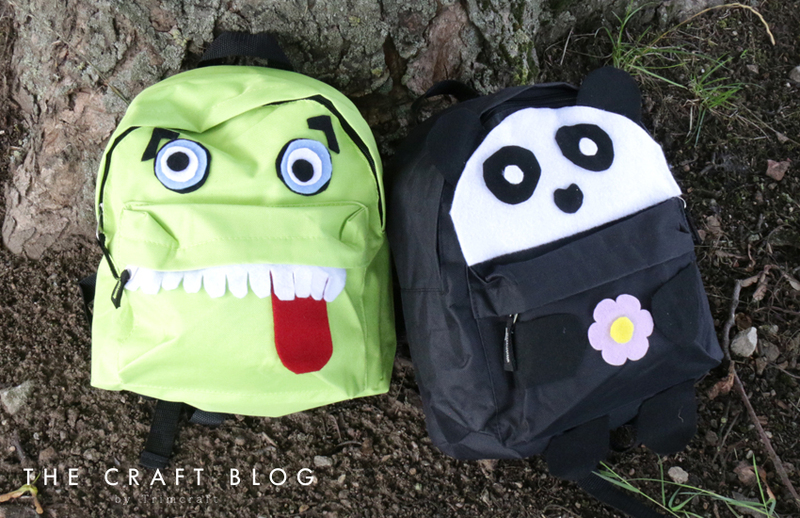 Today Maxine is going to show you how to transform a plain back pack into a panda and a silly monster (so cool right!) Read on to find out how easy it is for them to create their own felt friend! 1. Cut two ears out of Dovecraft black felt, adhere to the top of the back pack with Dovecraft Silicone Glue. 2. Cut out a piece of Dovecraft white felt to fit the top front of your back pack. Adhere to the back pack over lapping the ears. 3. Cut out 4 legs using the black felt, adhere two to the bottom of the back pack. Place the other two on the front of the pocket and adhere. 4. Use the black and white felt to cut out the eyes and nose, adhere to the white felt on the back pack. 5. Die cut a flower from the First Edition Flower Nesting die set onto purple felt. Next, cut a circle out of yellow felt to create the centre of the flower, adhere to the back pack. What a fab back to school craft! This back pack is genuinely too cute for words! Brilliant for panda lovers and those who want to make a cool fashion statement in September. Alternatively, you could make this fun monster design that will certainly make the kids giggle! For this, we have used a green back pack and Maxine has used black, white, red and blue felt to create this brilliant expression! How cool are these upcycled back packs?! What design will you use for yours? We would love to see so don’t forget to #trimcraft and toshare your makes in the Inspiration area!